Those of you with green fingers are going to love the Fields of Fortune slot machine from Ash Gaming as it sees you richly rewarded for cultivating beautiful flowers. To do so, you’ll have many tools at your disposal from trowels and forks to watering cans, with the bigger the flowers bloom resulting in greater rewards for you! The tranquil setting sees you in a field surrounded by lush trees with the reels contained in a wooden frame that has been crudely hammered together with nails everywhere – poor workmanship indeed, but thankfully sights you’ll experience as you stroll through this field are much more delightful as birds whistle in the background. Fields of Fortune is a 5x3 reeled slot offering 25 fixed paylines with you gaining access to the lush green fields from 25p up to £125, however these values double whenever you choose to turn the feature on by clicking the button positioned to the left of the spin button. This feature introduces Power Up Scatters that make it much easier to trigger free spins where you get to choose between two modes with a level-up feature included in both. The usual option of auto play can be utilised to save you from clicking the spin button repeatedly, for those of you in a rush or can’t take the drama of each reel spinning there is a turbo mode that you can switch on to make the symbols fall into place almost instantly, plus there are Expanding Wild symbols. It’s safe to say that you’ll be enjoying getting your hands dirty in these fields! It’s a beautiful rose which will be capturing your attention the most on these reels. It’s the Wild symbol which appears on the second, third and fourth reels only, with these becoming Expanding Wild symbols if this helps to create winning combinations. The other special symbol on the reels is the Scatter which is represented by a wooden sign post and these appear on the third, fourth and fifth reels, but whenever you activate the feature these will transform into scarecrows who help guide you to free spins! You will also see three flower characters - the Venus Flytrap, Snap Dragon and Dandy Lion which are joined on the reels by green beans, carrots, parsnips, trowels, forks and watering cans. 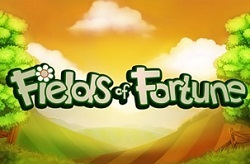 All the walking around the field of fortune will have you feeling peckish with your belly rumbling, therefore you’ll be very pleased whenever you capture the sight of three or more Scatter symbols at once as you’ll trigger a free spins feature that provides you with lots of carrots and parsnips to munch on. This is feat is made much simpler when you utilise the Power Up Scatter option, with this being enabled by activating the Feature option and thus doubling the cost of your bet, as Scatters which are one position above or below the reels will also count to trigger the feature. You will then have to pick between carrot spins or parsnip spins. While both modes provide you with unlimited free spins which only end once you land the Scatter symbol four times on the fifth reel, as the sun fades to dusk each time, there are key differences between each mode as explained below. Carrot Spins: Here you will be enjoying the perks of a dynamic multiplier bonus on each of your free spins which increases in value whenever you land a Scatter symbol. It will begin at 1x before increasing to 2x, then 3x and ultimately 5x when you’ll be hoping not to see any more of them as this will result in the feature coming to an end. Parsnip Spins: If you opt for parsnip spins the Scatter will transform the high-valued flower symbols into additional Wilds each time that it appears. On your first spin that a Scatter symbol appears all the Venus Flytrap symbols will transform into Wilds, the second time one lands all the Snap Dragon symbols will become Wilds too, the third Scatter symbol landing will see the Dandy Lion symbols join those aforementioned in becoming Wild, and once again the fourth Scatter will bring an end to the fun. These fields are certainly worth exploring as getting your hands messy with muck so often results in wins worth an absolute fortune. The biggest wins come from the carrot and parsnip free spins features, which only end once you land four Scatters during your free spins, and it’s safe to say that you’ll be returning to these fields many times more in the future to plant more seeds and watch beautiful flowers bloom!